As the frequency and intensity of catastrophic events continue to surge, organizations provide guidelines for how to pack a "Go-Kit" in case of emergency. The Five Gifts is like an emergency 'Go-Kit' for the mind, packed with information and insight that can minimize and prevent long-term psycho-spiritual damage from a traumatic event. It's a field guide for the heart and soul to guide you through to cycles of damage and recovery that can be useful before, during, and after a tragic loss, trauma, or disaster. In a nationwide Google survey Dr. Nadel commissioned for this book, 33% of those surveyed identified their greatest fear as a terrorist attack, followed by displacement from their homes. As this upsurge in violent episodes continues, the numbers show a greater likelihood that you, or someone close to you, will be directly affected by a traumatic event. But what if you had access to a mind-body-spirit 'Go-Kit' before disaster strikes? In The Five Gifts, Dr. Nadel wisely maps out a path integrating what she has learned from over two decades of working with people damaged by a trauma event. Her own life was impacted by the World Trade Center attacks of September 11, 2001 and Hurricane Sandy on October 29, 2012. The Five Gifts contains interviews with people whose lives were directly impacted by such major news events as the Rwanda genocide, the terrorist attacks of September 11th, 2001, Hurricanes Katrina and Sandy, the tsunami in Bali, and the Boston Marathon terrorist bombing. Although you can never be fully prepared for a shocking, traumatic event, this book will provide information, ideas, insight and tools to build the emotional stamina and clarity needed to cope with acute stress responses and emotional aftershocks. If you are open to receiving the gifts of Humility, Patience, Empathy, Forgiveness, and Growth, The Five Gifts will lead you safely through disaster and traumatic minefields. Swish! First, the storm broke through the back wall of the house where I was watching The Weather Channel. Ninety-mile-an-hour winds bashed tree branches against the triple-pane windows. Glug-glug! Mini-fountains began spouting up near the wall. Three hours to high tide. Ever since childhood, my dream house had been a cottage with a view of the water. I used to have a painting of one in my bedroom. When my divorce was finalized in 1993, a joint custody clause required that I live within a fifty-mile radius of the Empire State Building. This led me to Long Beach, a barrier island community of some 35,000 residents about twenty-five miles from Manhattan. A family-oriented beach community where I never had to lock my door, it met the requirements of both the joint custody clause and my childhood dream. From my front garden, you could watch boats in the Reynolds Channel at the north end of the block. In 2011, when Hurricane Irene breached the seawall at the end of the block, a small river ran down the middle of the street at curb height until the tide receded, but the house was untouched. After speaking to several first responders who advised me to put sandbags in front of the doors and hunker down, I decided that, whatever happened, I needed to see it for myself. Better to take action immediately than to worry from a remote location. Like the captain of a ship, if the house was going to float away, I was going with it. Team coverage! This just in! During my nearly two decades in TV newsrooms, I had committed multiple egregious acts of hurricane hype. No stranger to hyperbole masquerading as news, I checked the National Oceanic and Atmospheric Association (NOAA) website. The forecast called for a twenty-four-hour rain event with two to four inches of rain. This seemed to indicate that if the house flooded during high tide, the water would quickly recede when it ebbed. This turned out to be the case. When you think of fountains, you probably think of spas, gardens, and meditative spaces. But the gentle sound of water bubbling up as it spread triggered an eerie cognitive dissonance. This sound was not refreshing, and the visuals were unforgettably disturbing, even more so because the ankle-deep water was not coming from the Reynolds Channel, which was just reaching the sidewalk. A quick look out the back door revealed a four-and-a-half-foot sheet of water extending to a smaller canal, about 200 yards west of the house. As the flood surged to mid-calf level, my boyfriend and I began moving emergency supplies into the attic, along with Bogart the cat. Cat food, litter, water, blankets, first-aid kit, power bars, laptops, TV screen, and a backup drive were lifted to safety, along with candles, lanterns, matches, and an emergency radio/lantern that operated on electricity, batteries, solar power, and a crank. My boyfriend had laughed at me when I proudly unpacked this last item, having bought it from Macy's the previous May as a birthday present to myself. He was not laughing now. Nor was he laughing at the ten gallons of water I had stockpiled after my father appeared to me in a dream six months earlier. 'Buy water,' he said. 'You are going to need it.' My dad died in 1989, but I figured if he had gone to the trouble of showing up in a dream I needed to pay attention. Each time I went to the supermarket, I would grab a gallon of water to take home. After I had stockpiled half a dozen gallons, I was forced to admit that I had, in fact, become something of a closet prepper. Doomsday preparation suppliers were the network sponsors of Genesis Communications Network, where I hosted The Dr. Laurie Show: Your Place to Explore the Unknown and Expect the Unexpected from 2007 to 2009. We ran commercials for everything from gold to meals ready-to-eat to survivalseedsinacan.com. At the time, I'd thought of survivalists as a subculture, but during the past five years I had started to notice that high tides were covering all the marsh grass. The seas were visibly rising. I loved living near the water, but for the past few years it was looking like the ocean might someday pay me a visit. That day had now come—an hour and a half before high tide—when three and a half feet of water filled the entire house. The channel had overflowed the sandbags, pushing through the front door, leaving us completely surrounded. 'Guess we're not leaving now,' I shrugged. Crash! Gurgle! The refrigerator fell onto its side, floating near the back door. The washing machine and a ten-foot leather couch were floating, too. Titanic! In my own home! The flood was churning up books, manuscripts, potted plants, firewood, a loveseat, antique wooden chairs, and a legal bookcase. Wet clumps of paper towels and toilet paper smeared against the walls. Catching a whiff of natural gas, I called the gas company, only to have the phone go dead before I finished tapping out the emergency phone number. The smell dissipated, thanks to emergency shut-down valves in the water heater, furnace, and stove. For nearly two decades, the little house had provided a place of safety and refuge to hundreds of individuals who came for therapy and support after life-shattering events. In the quiet of my back office, I had written three books and several hundred articles for magazines and the New York Times, Times of London, and Huffington Post. I had lived here for a decade as a single mom, and friends from around the world had come for vacations. It was all being taken, right in front of my eyes. A strong wave pushed me from behind. Pulling myself up, I gripped the aluminum staircase to the attic and turned. A force far greater than I could comprehend was at work. My history and life as I knew it were being washed out from under me. Although I expected to feel shock and sorrow, in one sparkling moment an oceanic wave of tranquility washed over me from head to toe. My spirit released. What was gone was meant to be gone. What was over was meant to be over. An unmistakable spiritual presence was totally in charge. All I had to do was let go, and this Spirit would do whatever it meant to do. It was my choice and my privilege to be here at this moment, bearing witness to all this. We spent the night in the attic, watching the flood slowly creep up the stairs. It stopped at the fourth step, right around the time that we lost our transmission from CBS News on the emergency radio. After a few hours' sleep, the first light woke us up. Downstairs, a thick film of dirty grease and raw sewage coated the tile floor, walls, and every item in the house. Apparently, the main sewage pump had broken during the storm. The toxic smell of human feces made us cover our noses and mouths as we went into the street, where our neighbors had gathered, pointing cell phones at the sky, as if somehow that would help catch a signal. What were we supposed to do without power, phone service, or clean water? We were cut off from the rest of the world. Helpless. Confused. Yesterday's normal was completely gone. Unnerving? Yes. But that deep sense of calm from the previous night was still present. Curious about what my new world would be like, I gathered as many things as I could that were not contaminated and left for a month-long sojourn as a FEMA-certified, displaced person. After nearly twenty years in the same home, I left its ruins and moved six times in one month—to two different apartments in Brooklyn, to Washington DC, my brother's home in Dallas, and finally to a friend's basement close to a subway I could take to work, once the electricity had returned to lower Manhattan. When I charged my cell phone to call FEMA from a Starbucks in Park Slope, I yearned to go home, and then realized with a shock that I had no home. Once the power came back in Long Beach, I moved to a family member's apartment. Along the way, I found that I had managed to pack fifteen pairs of socks and no underwear. How did that happen? I bought a really ugly purple suitcase to lug everything I owned: a laptop, computer backup, financial documents, jewelry, and safe deposit keys. I figured that people would look at the purple suitcase and think, 'Anyone who has such lousy taste in luggage couldn't possibly have anything worth stealing.' From the looks of pity I got from fellow passengers waiting at baggage claim, the strategy worked. Walking through my old neighborhood, I realized that it had been a long time since I had hung out with lifelong friends. In some cases, years had slipped by without stopping for coffee or having dinner. In keeping busy, I had missed out on a lot of laughter. For years on end, I had failed to keep my New Year's resolution. An author and Zen master once told me, 'A friend helps you move. A real friend helps you move the body.' In this case, the body was mine. By taking every 'thing' away, Hurricane Sandy carried me into the arms of my real friends and my true family. I could not have wished for anything more beautiful. That's why I made the same New Year's resolution this year: Less stuff, more friends. I also discovered a considerable body of scientific research supporting the benefits of each trait. Trusting my spiritual instincts has become an organic process but finding research that backs up my intuition gives the Five Gifts a scientific seal of approval. Anyone who has traveled this road knows how arduous and long it can be. We have to expect the unexpected and keep going, even without a map or direction. In uncharted territory, we need new thinking, new ways of processing intense emotions, and new behavioral choices. If you open the book to a random spot, don't be surprised to find a useful piece of information or a new idea that seems to be just what you need. It is my hope that the Five Gifts can serve as a beacon to shine light into the darkness so that you can navigate to a new place of hope and strength. You can make it—one step at a time. ©2018 Laurie Nadel,. All rights reserved. Reprinted from The Five Gifts: Discovering Hope, Healing and Strength When Disaster Strikes. No part of this publication may be reproduced, stored in a retrieval system or transmitted in any form or by any means, without the written permission of the publisher. Publisher: Health Communications, Inc., 3201 SW 15th Street, Deerfield Beach, FL 33442. Laurie Nadel, Ph.D., is an expert on mental health and climate change. She has been interviewed in The New York Times, National Public Radio, Reuters, and CNN.com. A specialist in acute stress, she is a member of a critical incident stress management team working with first responders. After losing her home to Hurricane Sandy, Dr. Laurie ran long-term support groups for survivors. From 2003 to 2005, she directed a program for teenagers whose fathers were killed in the 9/11 World Trade Center attacks and wrote the script for After the Fall: The Rise of a 9/11 Community Center, narrated by Dan Rather. Her four-time bestseller, Sixth Sense: Unlocking Your Ultimate Mind Power, was featured twice on Oprah. A journalist for twenty years, Laurie Nadel reported for Newseek and United Press International in South America, wrote TV news for CBS, ABC News and Reuters Television, and was a religion columnist for The New York Times' Long Island section. 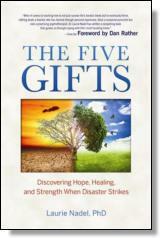 The Five Gifts: Discovering Healing, Hope and Strength When Disaster Strikes is her seventh book.